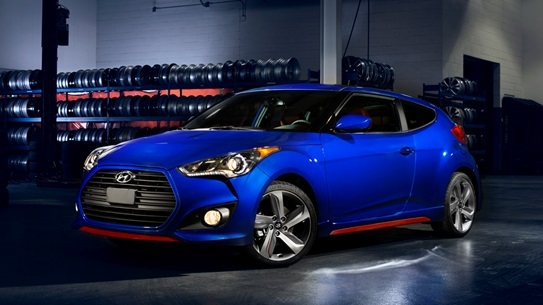 Hyundai today announced the addition of the Veloster Turbo R-Spec to its line-up at the Los Angeles Auto Show. The heart of the R-Spec is the responsive, aftermarket-tunable 1.6-liter, direct-injected, turbocharged engine, along with unique design cues, enhanced chassis tuning, a B&M Racing® Sport Shifter, and the lowest price point in the Veloster Turbo lineup. R-Spec production will begin in December 2013 with availability in early February 2014. Veloster Turbo R-Spec is the fourth R-Spec model in Hyundai’s lineup, following in the footsteps of Genesis Coupe 2.0T R-Spec, Genesis Coupe 3.8 R-Spec and Genesis 5.0 R-Spec. R-Spec represents the ultimate performance version of each of these models. For Veloster Turbo R-Spec, sport suspension and steering settings have been retuned for optimum responsiveness, with higher spring rates and a more rigid transmission mount. On the powertrain side, R-Spec is available only with the 6-speed manual transmission, and a short-throw B&M Sport Shifter has been added for a tighter, more direct shift feel. On the exterior, R-Spec adds a sporty red-accented front splitter and side blades, with R-Spec badging on the rear hatch. Inside, red leatherette bolsters with red/black cloth insert sport seats complement special embroidered-logo R-Spec floor mats for a sporty ambience. Veloster Turbo R-Spec will be available in four colors: Elite White, Ultra Black, Marathon Blue, and exclusively for 2014 Veloster, Sprint Gray. In keeping with its purist driving focus, some standard equipment from the Turbo model has been deleted from the R-Spec, such as proximity-key entry with push-button start, premium gauge cluster, side-repeater mirrors, driver’s auto-up window, high-gloss interior cues and full-faced heated leather seats. Adding to the focused driving experience for all 2014 Veloster Turbo R-Spec and Turbo models is Torque Vectoring Control (TVC). This active cornering feature, utilizing capabilities from the Electronic Stability Control (ESC) and powertrain control systems, improves dynamic cornering during more enthusiastic driving. TVC uses wheel-speed sensors coupled with ESC algorithms to apply precise braking force to the inside front wheel during spirited cornering. This active braking redirects power to the outside front wheel in the turn, reducing wheelspin, for enhanced cornering grip and corner-exit acceleration. Overall, TVC provides Veloster Turbo R-Spec drivers with an incremental margin of cornering precision during enthusiastic driving. Inside the cabin, 2014 Veloster Turbo R-Spec and Turbo models receive Active Sound Design (later availability), which provides richer in-cabin powertrain resonance for an even more involving driving experience, especially during spirited driving. No user commented in " HYUNDAI TURBO R-SPEC MODEL JOINS VELOSTER LINE-UP "